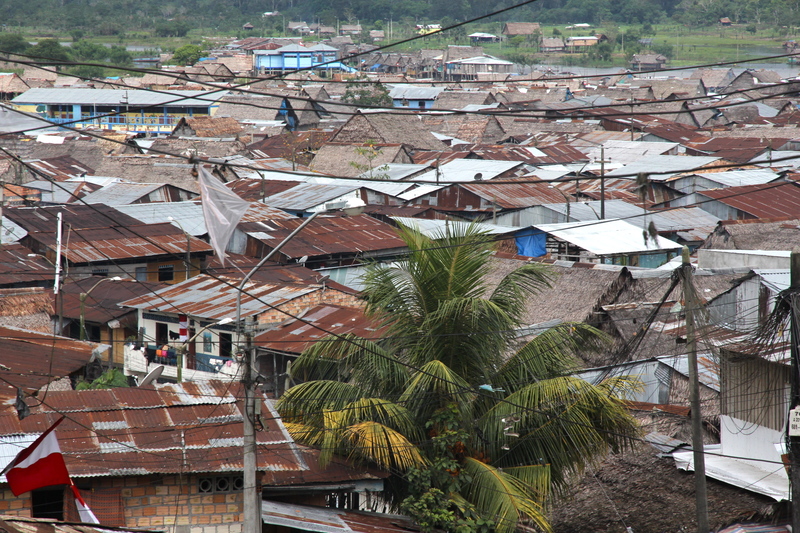 Tucked into the extreme northeast corner of Peru, the city of Iquitos has a population of about four hundred thousand, making it the largest city in the world inaccessible by road. If you only saw the area around the central Plaza de Armas you’d never know it was that large though. The downtown business district, compact and lacking a single high-rise office tower, looks like it would belong to a city a quarter that size in North America, an observation that hints at the deep and extensive poverty of the area. The bulk of the population is spread throughout sprawling, ramshackle, dirt/mud road neighborhoods that fan out from downtown. 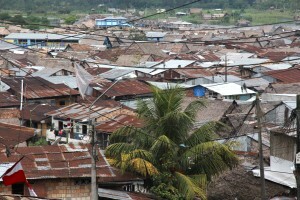 The appearance of these sub-urban barrios is evidence enough of the poverty. Nobody seems to have any money for home repair, let alone even the most basic of aesthetics. When you get away from the downtown area, even the nicer looking homes are typically slapped together with mismatched materials. 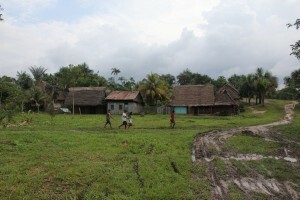 Many residential areas are packed tightly with hastily constructed, conjoined houses made of unpainted wood and covered with the traditional thatching. The distinct impression one is left with on seeing street after humble, cluttered street like this is that for the great majority, every spare centimo goes toward survival necessities. Meanwhile, parallel to and largely disconnected from the daily grind of the majority, is the ayahuasca tourist business. I’ll assume there are still a few innocent souls out there who aren’t yet aware of ayahuasca. It’s an ancient healing, visionary brew of the Amazon that in the twentieth and twenty-first centuries has moved beyond the indigenous jungle environment and is now spreading its gifts rapidly throughout the developed world. Though there are numerous locations in several countries in the region to encounter the ritual use of ayahuasca, Iquitos has become a major hub. People from all over come looking for opportunities to drink the brew in ceremonies led by local shamans. I guess I’d be counted among that number, going back to Iquitos for the second time in four years to attend and speak at the Seventh Annual Amazonian Shamanism Conference. My travel companion Ashley and I arrived two days before the start of the conference and stepped out of the plane from Lima into an attention-getting blast of hot, humid air and midday equatorial sun. This was in July, which in our terms would make it wintertime down there, if you can include such a word in a description of the climate in Iquitos. The city sits a mere four degrees south of the equator in the lowland jungle that borders the Amazon River. The average daily high temperature in each and every month of the year is over 30° Celsius, or 86° Fahrenheit, and the average annual humidity 85%. 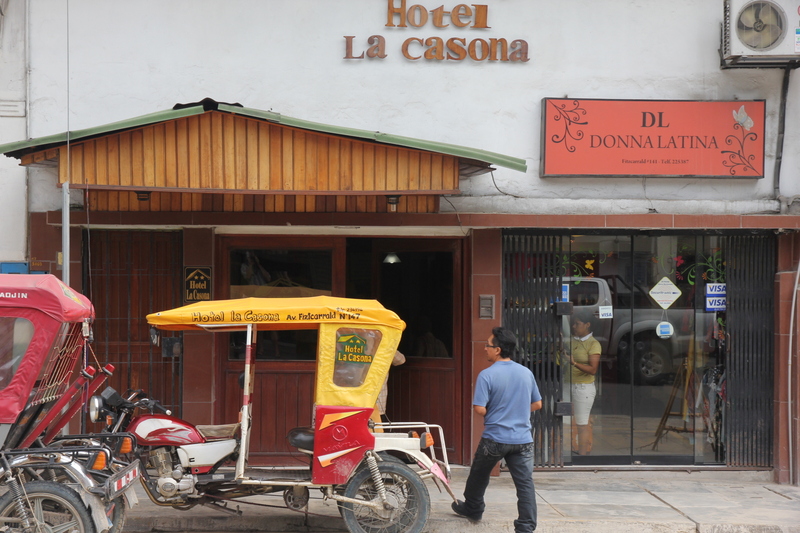 You see very few cars on the streets of Iquitos. But there are swarms of small motorcycles and even more motos. Motos, also known as mototaxis, are the result of some resourceful person’s idea to replace the back half of these motorbikes with two-wheeled, three-seat carriages and attach vinyl or cloth tops to protect against rain and sun. Loud, raw-exhaust-spewing creatures, they dash and weave around each other four or five abreast on the mostly one-way streets of the city. The air is distinctly visible as a sooty brown haze, especially at night under the streetlights, and usually smells the same; some sort of unidentifiable stew of exhaust fumes and all the other odors of a humid, tropical, open-door city that wears its aromas on its sleeve. Despite all that, I almost always get a little thrill, especially in the evening, riding in the back of a moto, the warm tropical wind in my face and the color and buzz of the vehicles all around us as we thread our way through town. We got ourselves settled in and refreshed, me with my clothes and paraphernalia unloaded into drawers and onto hangers and Ashley with all her stuff spilling out from two small suitcases on the floor beside her bed in preparation for its gradual but inexorable expansion in my direction over the next twelve days and nights. Ready to head back out, I informed Ashley of the requisite next stop: a restaurant incongruously named The Yellow Rose of Texas, diagonally across the plaza from our hotel and the hangout of choice for many of us participating in and presenting at the conference. The Yellow Rose is co-owned by Gerald and his wife Pamela. Gerald, probably in his late fifties, is a Texan expat and former oilman with some of the suspect attitudes and political opinions you might imagine from someone with that background. I spent a lot of time at the restaurant and after some friendly teasing Gerald warmed up and showed himself to be a good-hearted guy whose blunt pronouncements and prejudices are presented more as a ploy to keep people off their guard. Gerald was a deep well of knowledge about Iquitos and how to negotiate it. For example, I always asked him first before commissioning a moto to someplace I hadn’t yet been. For a trip that other conference attendees told me cost them five soles (a little under two dollars) Gerald would say two, never more than three. That knowledge gave me the confidence to walk up to the drivers and say something like, “Sabe donde está el Hotel Sol Del Oriente?” Then I’d hold up three fingers—didn’t want to be too hardnosed about it—and announce, “Tres soles.” I rarely got a rebuttal, or even a frown. The conference is the brainchild of another American expat, Alan Shoemaker. 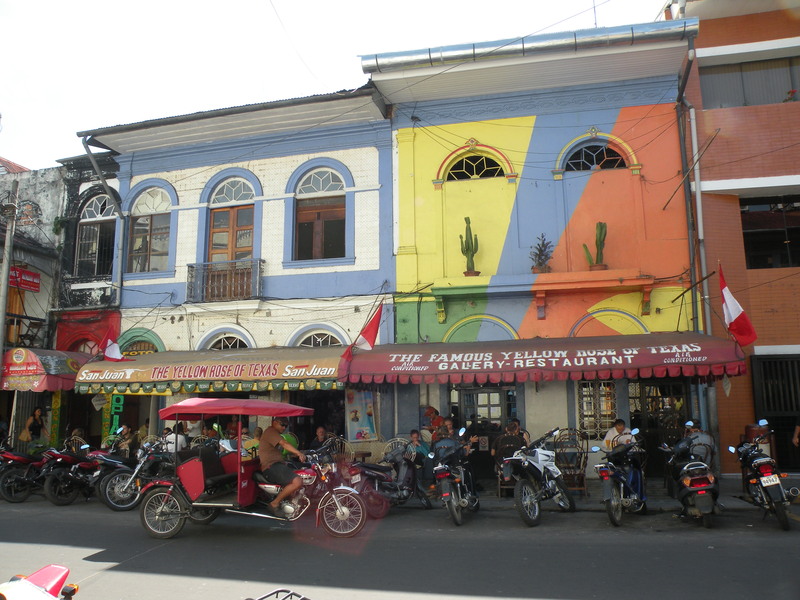 Tales of how Alan found his way to Iquitos would make a fascinating story in itself, with bold excursions into little-traveled regions complemented by a few hair-raising adventures. He’s been in Iquitos for about twenty years now and although at one time he went through the traditional training of an ayahuaca shaman, seems to have settled into the role of conference organizer and adventure-travel guide. The Hotel Sol del Oriente, the site of the conference, is about ten minutes by moto from the Plaza de Armas. The format for the conference consisted of two days of presentations, one for ceremonies, two more of presentations, one more for ceremonies, a last day of presentations, followed by another day for ceremonies. On the first two days the eight or nine invited shamans from the surrounding area spoke to the attendees and answered questions so that at the end of day two we could choose which shamans we’d like to do ceremonies with. The shamans ranged in age from about thirty to over seventy and two of them were women. Frank, a newfound and quickly trusted friend, told me he’d been out to Ricardo’s center and felt really good about it. He described it as clean and I knew he meant more than simply physically clean. During the time the shamans were introducing themselves there were a lot of murmured conversations around the question of who to work with. It came out in a few of those quiet chats that issues of professional ethics had been plaguing some of the better-known shamans of the area. The reputation of one of the most well known had recently been seriously tarnished by repeated allegations of sexual impropriety. Another popular shaman had apparently allowed his success and newly acquired wealth to go to his head. Stories were drifting around that he had gotten careless with his ceremonies and had maybe even fallen into the dark territory of the brujo, or sorcerer. Brujería is enough of a concern that it’s worth elaborating briefly before continuing. Charlatanism and other versions of corruption are pretty much guaranteed to raise their unsavory heads when there’s good money to be made, in this situation almost certainly exacerbated by the economic poverty of the region. But there’s another, more ominous side to the Amazonian shamanic environment. It seems there has been a long history of sorcery in the Amazon. Steve Beyer, in his highly informative book on the mestizo shamanism of the Upper Amazon, Singing to the Plants, wrote that envidia, or envy, is common among the people there. Successful people as well as those perceived to have wronged or bested someone often become targets. It would take a much more in-depth discussion than is relevant here to explore this phenomenon and describe the techniques and power of sorcery, not that I know much about it anyway. Suffice it to say that a wealth of reliable evidence confirms that brujos, twisting the power of the plant medicines to their destructive ends and using techniques we in the modern cultures would call magic, are able to wreak serious psychic and physical damage on their victims, in some cases even to the point of causing death. Back to the conference. I had thoroughly enjoyed my visit to Iquitos and the conference in 2008 and had had some remarkable experiences drinking ayahuasca in the jungle with well-trained and experienced shamans. Since then I had written a book, Returning to Sacred World, that included discussion of ayahuasca and some other healing/awakening plants. I wrote Alan to ask if he’d be interested in having me as a presenter at the conference and he readily agreed. That, and the anticipation of more powerful ceremonies in the traditional homeland of the “vine of the soul” were enough to bring me back. After the first two days of talks by the invited shamans, the presentations turned out to be a loose-around-the-edges mix of topics more or less related to Amazonian shamanism and ayahuasca. A couple of examples of the apparently more peripheral themes addressed: Brien Foerster gave a very interesting talk and slide show presentation mainly on the sacred architecture of the Incas, particularly as evidenced in and around the city of Cuzco. John Alexander, who has had connections very high up in the American military, spoke on the myths and realities of UFOs . The first impression some of us had about that topic was, “Other than being outside the mainstream, where’s the connection?” Then a friend pointed out to me that there’s a sizeable body of reports by ayahuasca drinkers of visions of extra-terrestrial beings and sometimes of vehicles. In the ayahuasca inebriation some people have apparently even seen UFOs with their eyes open. For me, and I suspect for many of the other attendees, it was the ceremonies themselves first, and the opportunity to meet and talk with interesting people second, that were the big draw. As the week passed, attendance at the presentations shrank. In fairness to the speakers and to Alan’s hard work pulling and holding the event together, the ceremonies had much to do with that. A lot of us had to go out of the city, sometimes an hour or two over rough dirt and mud roads, to get to the centers of our chosen shamans. Most people probably got somewhere between three and zero hours of sleep after the ayahuasca medicine let them go in the wee hours of the morning, and then had to come back, eat a midday meal, clean up, and perhaps rest before making it back to the conference site. Taking Frank’s advice, I decided to go to Ricardo’s center for the first ceremony. Two mototaxis were arranged for the early afternoon to collect the five of us who had signed up with Ricardo’s two assistants at the conference site. For the first half hour of the trip to the center we traveled on the paved road that goes toward and ends in Nauta, a small town about a hundred kilometers away. People told me it’s the only road going anywhere else from Iquitos, although Google Maps indicates one going in the opposite direction about 20 miles/30 km to a village called Mazán on the Rio Napa. In any case, the next hour took us along a bumpy and battered dirt road. It rains a lot around there and it’s not uncommon to hear tales of motos tipping over or getting stuck in the muddy sections. This is seriously rural country, through semi-forested landscapes and past tiny, thatch-roofed villages with no electricity or running water. Ricardo’s center is, just as Frank had described it, clean and well organized. The maloca, the structure in which the ceremonies are held, is the largest and most beautifully constructed I’ve yet seen. During the hours spent in the embrace of ayahuasca, the high, dome-like ceiling gave the maloca a spaciousness that seemed to mirror and enhance the mind-opening effect of the medicine. Another building near the maloca has several washrooms and showers, all clean and with flush toilets and sinks with running water, soap, and hand towels. One nearby building is dedicated to cooking and eating and a couple are for short and long term retreatants and apprentices. 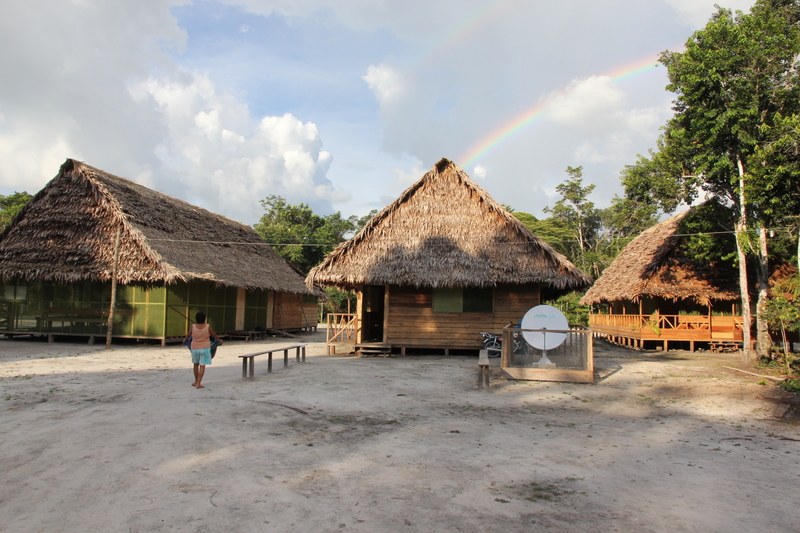 The staff—mostly very friendly—also live onsite in housing off to the edge of the large clearing in the jungle. I was told that between staff and their families, about twenty-five people live there permanently. Ricardo is Shipibo, one of the indigenous groups of the region. He’d gone through a lengthy, rigorous training period under Guillermo Arévalo, a well-known master shaman, also Shipibo, before recently striking out on his own. The traditional training involves, among other challenges, drinking a lot of ayahuasca over a number of years and undergoing long periods of tightly restricted diets, sometimes in isolation, for the purpose of getting to know the helping spirits of a variety of plants. 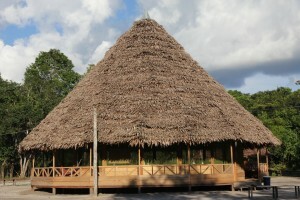 We were offered tea, coffee, and fruit in the dining hall and then invited to find places in the maloca. Around 6 p.m. Ricardo, his ceremony partner Julian, and three of his apprentices, one to act as translator from the Spanish, came into the maloca and gathered us together for an intention-setting session. This is a useful practice Ricardo received from his teacher. It’s also made its way into the ceremonies of several of Guillermo’s other apprentices working up here in the U.S. and Canada. It’s commonly held that ayahuasca, which is always considered a living intelligence, responds to the requests of the supplicant, so focusing on what one really needs can be very useful. Ricardo and others see their job at this point as helping us clarify our intentions. Ricardo also said that he and Julian sometimes sing specific ícaros—songs taught him by various plant spirits—to address the stated concerns of the participants. A useful reminder I’ve heard more than once is to come to ayahuasca with intention but not expectation. Holding any kind of fixed idea about how the response comes will very likely cause you to miss it when it does come. Ayahuasca, just like the Muse of creativity and so much else of value to us on the path of awakening, doesn’t play by the rules of the known, the rational, the linear. She comes to everyone differently and to each one in different ways at different times. She has her own language, her own symbols. She’s an artist. She’s a poet. After thirteen ayahuasca ceremonies over several years I’m just beginning to realize how much there is to learn about her ways of teaching. In that interview on the master plants the apprentice says that they teach you how to understand ayahuasca and how to become an active participant in the journey in a similar way that people speak of lucid dreaming. Peter Gorman, one of the presenters at this year’s conference and a life long ayahuasca journeyer, described three levels or stages of learning to work with ayahuasca. I have no transcript of his talk so I’m going on memory here. Peter described the first stage as the visionary stage. Ayahuasca visions can be specific but also highly abstract. Most of my visions have been abstract and symbolic. Sometimes I get it and other times I have no idea what if anything of import she is showing me. I believe the second level is more about discovering ayahuasca’s healing potential. According to Peter, at the third stage, which he admitted he is just finding out about himself, ayahuasca can show you anything you ask it to—journeys through time and space, visits to alien civilizations, mysteries of the universe, what your lover is doing while you’re away, and who knows what else. The ceremonies I’ve been at typically begin about eight o’clock in the evening and this one was no exception. The maloca is darkened except for candlelight and the participants are invited to come up one at a time to be handed a small cup of the harsh tasting brew. Ricardo suggested we briefly restate our intentions at that point and then again as we feel the effects coming on, most often somewhere between about twenty minutes and an hour in, though definitely not always limited to those borders. In my own experience and that of a number of others I’ve heard from, ayahuasca can be very unpredictable in the way she comes to you. You could drink the same quantity of the same brew on two different nights and have two wildly different encounters of completely different potency. Compared to my previous experiences and confirmed by the next two, also at the same center, Ricardo’s brew was strong. He explained that a lot of shamans mix several plants together in their brew but that he keeps it to the two essential components: the ayahuasca vine, or Banisteriopsis caapi, and Chacruna, the DMT containing plant. Once we were all back at our mattresses with the brew in our bellies and ready to do its work, the candles were blown out and the generator providing electricity to the center turned off to leave us in all but total blackness. Drinkers are welcome to lie down but shamans I’ve encountered suggest you sit up if possible. Just as in meditation practice, sitting up probably encourages wakefulness and mental sharpness. In this situation there may also be a sense of respectfulness in meeting ayahuasca that way. As I said, ayahuasca often presents itself in abstract ways. I can’t honestly say much about what I learned from that first night, though I’ve been told several times by shamans and experienced drinkers that the medicine does its healing and rebalancing work with mind and body whether or not the drinker is consciously aware of the impact. I can say though that this one was definitely strong, with distinct and often stunningly beautiful visions. The potency of the medicine made it a challenge to stay present and keep breathing and letting go. I’ve heard a number of accounts from people who say they have met the spirit of ayahuasca directly and I had said in the intention-setting session that one of my intentions was to have such a meeting. Paolo, Ricardo’s translator, told me that she is often green. I recalled that my previous visions had had very little if any green, leaning instead toward deep, rich blues and golden yellows. During this ceremony I may have met her because for the first time a lot of beautiful, rich, green moved through my field of vision in flowing, serpentine patterns. A brief mention here in case anyone is wondering about my use of “her” to describe ayahuasca. Though some have said the spirit has appeared in male form, the more common experience has been to engage with apparently feminine energies. Ayahuasca is often considered the mother of all the medicine plants in the Amazon. Songs, prayers, and stories sometimes call her Madre Ayahuasca, Mother Ayahuasca. Though I can’t confirm that from personal experience, there are qualities of richness, fecundity, nurturing, and life-giving that hint of the feminine principle. Another beneficial feature of Ricardo’s method of working is to have a sharing session in the morning, gathering again in the maloca after everyone has had a chance to eat some breakfast and wash up. Sharing the details of an ayahuasca journey can be like describing your dreams: not always recommended—listeners’ eyes may glaze over. Ricardo asked us to stick to the key elements and then he generously offered his take on our descriptions. I was sufficiently impressed with Ricardo’s center that I chose to return there for the second ceremony instead of exploring any of the other invited shamans. Someone said something that made sense to me. Doing more than one ceremony with the same shaman and his medicine gives you and him the opportunity to continue and deepen the work. This second engagement with the medicine proved to be by far the most powerful journey I’ve yet had with ayahuasca. By the way, I use the word journey deliberately. If you haven’t drank ayahuasca I can tell you that a strong experience definitely feels like a journey, and sometimes an epic journey. I share a little about this one because some elements of that particular journey illustrate one of the ways she works with us as well as demonstrating the importance of working with well-trained shamans. In the sharing session after the first night Ricardo suggested I drink a little less on the second night. He also mentioned later that he had made a slightly milder brew for us for that second journey. He said that Paolo would come around to check on me after about an hour and if I didn’t feel any effect from the medicine I could drink some more. Paolo finally passed by after about an hour and a half. At that point I felt very little. I told him that and he took me up for a small top-up. At the same time, Julian sang an ícaro to me, something they do for all the participants whether or not they ask for seconds. In less than five minutes after returning to my mattress the potency had gone from the equivalent of a gentle walk to being swept up in a torrential river. One of the assistants told me the next day that she has often seen both Ricardo and Julian awaken the power of ayahuasca on the spot with their ícaros. The visions were stronger than ever and seemed of a different order than in past encounters. Though not easily decipherable in left-brain terms, they felt strongly symbolic, as if the images contained self-existing power and meaning. The symbolism also hinted at Native American imagery, which I took as support for the harmonious combination of this work with my long time engagement with the peyote medicine prayer ceremonies of the Native American Church. Though it may sound like a la-dee-da homily right out of the 1960s’ “All You Need is Love” playbook, a few insights in the weeks following reminded me that my affirmative answer that night barely scraped the surface of what the ayahuasca spirits were transmitting to me. I’m gradually realizing that the essence of that invitation points at nothing less than a radical and all-encompassing opening of the heart. I recognized that I was too casual by far in thinking that by answering yes to the offer I had taken care of the issue. I now see it as an ongoing challenge requiring great commitment and courage. That night the medicine never really let me go enough to fall asleep. It was still visual at four or five in the morning. In the morning sharing session I said that I had a lot to process and probably wouldn’t do a third ceremony. Ricardo invited me to come along anyway and drink a very small amount. He said he would sing an ícaro specifically for the purpose of helping me open that heart connection further. I mention this final ceremony for two reasons: first, as yet another reminder of the influence of the shaman in the work and the ability of the medicine to transcend or ignore conventional physics; second, because of a lesson about ayahuasca demonstrated by the behavior of one of the other drinkers. That was when I was called up for Julian to sing to me and again, to my complete surprise, the delicate breeze tickling my consciousness immediately—I mean within about two minutes—transformed into another powerful wind. Such a mysterious and remarkable plant. I wouldn’t want to claim this in a science journal but of all the visionary/healing medicine plants, ayahuasca may be the one least bound by any conventional physical restrictions. One drinker told me the story of a night when she drank the same quantity as the others in the ceremony and experienced absolutely no effects during the whole five hours or so that everyone else was going through it. Just as the ceremony was winding down and people were beginning to drift off to sleep, this woman finally remembered that she could ask the shaman for help. While no second cup was offered, the shaman sang an ícaro for her and prayed over her with the sacred tobacco. She then returned to her mattress and went through a full-on, full-length journey while all around her slept. The second reason for discussing the third ceremony at Ricardo’s center is because of the lesson inadvertently offered by a young man I’ll call Ron who came to that one. I’d met Ron at the conference and gotten a sense that he had a very fixed mind. He was intelligent and articulate but was obsessed with conspiracy theories, totally convinced that the powers that be are holding us all down in nefarious and multiple ways. Of course there may be some truth to that but in Ron’s case it became clear, particularly during the ayahuasca session that night, that his views were functioning as a solid obstacle to any spiritual opening. Spirit plant medicines like ayahuasca are sometimes described as ego dissolvers, spiritual practice amplified and condensed. Ron’s adversarial jousting with the medicine that night was a dramatic demonstration of how ego operates to ward off perceived threats. Ron was clearly terrified of what he might find if he let go of his solid fortress of ideas. The shamans began their ícaros about half an hour after we drank. Remember we’re in complete darkness for these ceremonies. Drinkers are also asked to remain as silent as possible so as not to disturb the inner work of those around them. As soon as Ricardo and Julian started singing, Ron picked up the bucket he was given for purging, turned it over and began drumming on it with an on-again off-again relationship to the pulse of the music. He also turned on his flashlight and waved it around the room. While this was going on he was smoking cigarettes and talking aloud to himself. For reasons unknown to me the shamans and staff chose to leave Ron alone. Thankfully, he got up and went outside after awhile, where he remained for most of the evening. I could hear him in the distance singing and talking to himself for much of that time. I’m convinced that he never allowed a moment’s gap in the discursive mind and that’s the reason I’ve shared this odd little tale. There’s a general application to Ron’s behavior that night, as I said, a condensed and heightened demonstration of how ego operates, especially when threatened. Ron admitted, almost boasted, that he wasn’t listening to the healing songs and, just like during his first two ceremonies that week, felt essentially no effect from the medicine. For most of us, to varying degrees, it’s as if God, enlightenment, reality, or whatever you prefer to call it, is speaking to us, letting its presence be known, inviting us. But we’re closing our eyes, putting our hands over our ears, and chattering to ourselves to drown out that voice. That’s why the wisdom teachings often remind us that healing and awakening can only enter in the gap, when the speed of the obscuring mind has slowed down enough to allow something else to come through, something that was there all the time but unable to penetrate the layers of protection. As a kind of summary, I want to step back now and take a larger view of ayahuasca’s quickly expanding footprint. Despite its challenges, and though it is definitely not for everyone—Ron stands as a case in point—I and many others as experienced as or more experienced than I have seen that ayahuasca can be a great help to humanity. And Lord knows we need all the help we can get as our planet teeters on the edge. At the same time, there are concerns about how this expansion is occurring. The following are not hard facts or thoroughly studied analyses. They’re offered as food for thought that others working with ayahuasca might consider as events move forward. I’ve heard conflicting anecdotal reports on this first issue. No one seems to be completely sure of the total situation. You either already knew or recall from above that ayahuasca is made from a brewed combination of at least two plants. I’ve heard from several sources that the vine is becoming scarcer as the demand increases. There may already be or may soon be significant sustainability problems. It seems harvesters now have to go ever deeper into the jungle to find it and also have to collect younger plants than previously. I’m told that using younger plants often means weaker brews. A second concern was expressed to me recently by Mel, a man who has been working with economic development issues and projects with indigenous people in Peru. To my knowledge, the shaman functions in many places as the local doctor, using his or her knowledge and a variety of plant medicines to deal with health issues in the community. Mel told me that the influx of ayahuasca tourists has made it very difficult for locals to have access to the shamans. A great many are very poor and previously might have negotiated an affordable payment such offering a chicken or arranging a work trade. Now, so the story goes, many of the shamans are devoting their time to the much wealthier foreign visitors and are no longer serving their own communities sufficiently. I asked Mel what he thought we foreigners should do about problems like these two and his answer was, “reciprocity,” giving back. “How,” I asked and he said that there could be a number of ways. One is to contribute labor, money, and/or ideas toward social and economic development projects. One example he mentioned is to work toward replanting the vine, perhaps in farmed areas. One final issue that needs careful attention is that with the rapid spread of the ceremonial use of ayahuasca there is of course both a need and a burgeoning market for more ceremony leaders. There is real money to be made, and no doubt egos looking to be aggrandized as well. Out and out charlatans as well as poorly trained, self-declared shamans are appearing more frequently, at least according to reports coming my way. These current and potential problems need to be looked at carefully with clear-eyed compassion for ayahuasca to be allowed to do its work in the most beneficial way for the greatest number of people. It’s a brilliant and beautiful medicine that has immense potential to help struggling humanity reconnect to our true nature as awakened spirit beings.